Hawaii – a tropical paradise, full of sun, fun, palm trees, beauty, mountains, volcanoes and more. But wait…have you ever thought about Hawaii and tropical cyclones? Although not frequent, tropical cyclones have battered the Hawaiian Islands several times in recent memory. The 1950’s were a very active period for Hawaiian tropical cyclones. Hurricane Nina (1957) passed 100 miles west of Kauai, producing winds of 71 knots (kt) on the island of Honolulu. Nina brought heavy rain and wind to the islands, causing over $100,000 in damage. Two years later, Hurricane Dot (1959) impacted the islands of Hawaii. Days before landfall, Dot threatened the Hawaiian Islands with maximum sustained winds of 130 kt. However, she made landfall as a Category 1 storm, with gusts up to 87 kt. This weakening in strength lessened the extent of damages, although it left its mark in the form of 6 million dollars in damage. Iniki passing over the island of Kauai. Image courtesy of NOAA. Next on the list of memorable cyclones is Hurricane Iwa of 1982. Like Dot, Iwa was also a Category 1 hurricane. The island of Kauai felt the force of Iwa on November 3, 1982. Iwa brought winds of 96 kt., gusts over 104 kt., 30 foot waves, and storm surge. Following this event, Hawaii was left with 234 million dollars in damages. 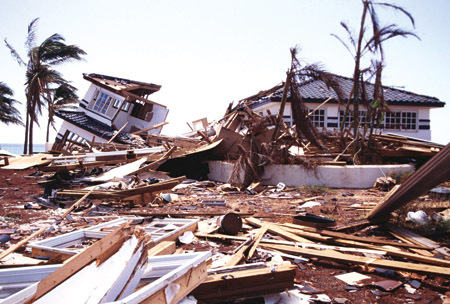 10 years later, in 1992, Hurricane Iniki released its wrath on Hawaii. In the Hawaiian language, Iniki means “strong and piercing wind’; this storm truly lived up to its meaning. Its eye passed over and slammed Kauai as a powerful Category 4 hurricane with winds up to 126 kt. Iniki claimed 6 lives and left the citizens of Hawaii to recover from 1.8 billion dollars in damages. Iniki destroyed over 1,000 homes and severely damaged more than 4,000. To this day, Iniki may still carry a ring that brings back memories of devastation to the citizens of Hawaii. It remains the strongest storm to date to hit Hawaii. Due to its devastation, the name ‘Iniki’ was retired in 1993. When the name of a hurricane has been retired, it cannot be used to name other storms for at least 10 years. 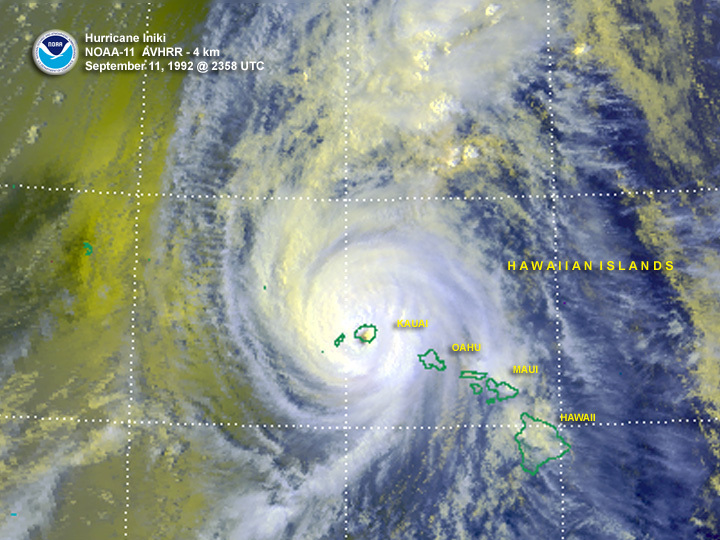 Hurricane Flossie (2013) was the most recent cyclone to affect Hawaii. It caused minor damage to the islands. Visit Cyclone Center today, while there you may get the chance to classify images of Hurricanes Iwa and Iniki. Davanna G. Saunders is an undergraduate student in Atmospheric Sciences at the University of North Carolina at Asheville. She recently joined the Cyclone Center team as a classifier and contributor to our social media.